We've been working on our home's curb appeal ever since we moved in almost 2.5 years ago. Quite frankly, the house was just a brown box on the outside. Light brown brick, darker brown siding, a brown door. It was really... brown. I took this picture when we initially toured the house. The first major curb appeal improvement was simply removing the window screens and adding black shutters. And then this happened... Bye bye, big oak tree. And then another hail storm forced us to replace our roof a couple of weeks ago. 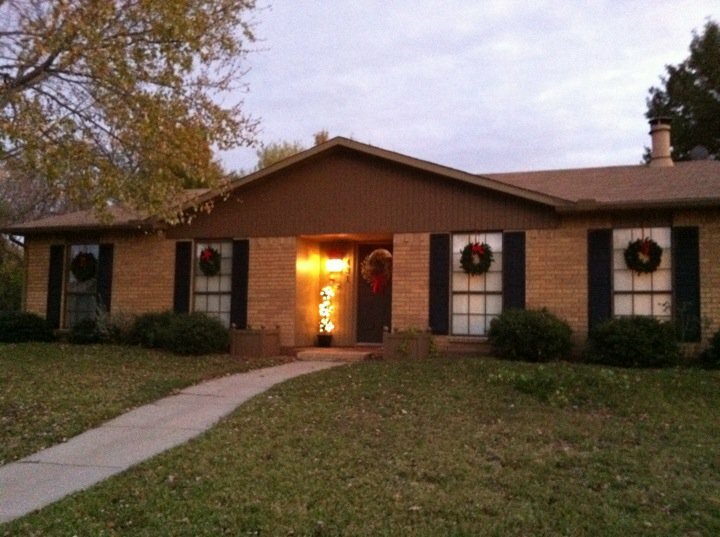 We went with a darker color to tie in with the black shutters and door. We took care of two other small upgrades this past week. First, we switched out the house numbers and moved them beneath the light by the front door. The new numbers a modern, san serif style that I really like. What do you think? As for the planters, I took a little poll on the blog and on Facebook about what color we should paint them. I was leaning toward black to tie in the shutters and door, and my decision was reaffirmed when most of you chose black! To those of you who suggested more daring colors like red and turquoise... I'm sorry. You are more brave than me! I had to go classic and traditional this time– it just felt right. I snapped some pictures with my cell phone as the sun was going down, so they aren't that great. I'll try to get better pictures tomorrow! I still haven't rearranged the mulch and stuff around the planters yet, since I had to move it away to paint them. I definitely think the black helps the planters "pop" instead of blending into the house like they did before. What do you think? And now for a more dramatic before and after, let's see how far the front of this little 1979 brown box has come in the past 2.5 years! The nice thing about all of these upgrades is that they were really affordable. (Well, except the roof– but insurance paid for that!) The priciest thing we've added have been the shutters, and those were only $160. If you don't count the roof, we've spent less than $200 to get the front of the house to this point. I think that's pretty good! What's on his to-do list? And what's on tap for me this week (once I get off work)? • Put the Christmas decorations up! • Clean, clean, clean, eat, eat, eat (yum) and shop, shop, shop! 'Tis the season! We should have a lot of projects to show you next week, so that's exciting. What are your holiday plans? I hope they involve a lot of yummy food and quality family time!